We've been providing ground support for over 9-years so we know what the real advantage of buying used is. We have just received a shipment of 22 MB-4 pushback tractors. These units were recently fully refurbished by the military prior to disposal. As such they are in excellent low mileage condition. We have over 15 propane bag tugs in stock and ready to ship with various Draw Bar Pulls. 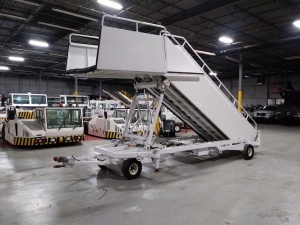 Used Aircraft Ground Support Equipment - Aircraft Tugs, Pushbacks, Cargo Loaders, Belt Loaders, Aircraft Stairs and more. 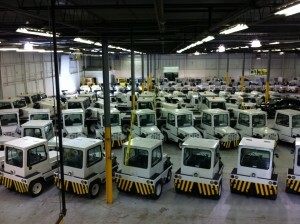 Global GSE is a distributor of used and refurbished aircraft ground support equipment. Global GSE is also apart of the International European Aviation and Skybus group of companies, which have over 28 years of experience in the aviation industry. Over 1200 units of airport ground support equipment are in stock at our dedicated facility one mile from the Indianapolis, Indiana airport. This includes large quantities of aircraft tugs, pushback tractors, baggage tractors, aircraft belt loaders, aircraft passenger stairs, aircraft cargo loaders, aircraft refueling trucks, aircraft deicer trucks, lav trucks, water service trucks, aircraft ground power units, aircraft start units, and baggage carts. Shipments of aircraft ground support equipment arrive weekly, so please contact us for any GSE you may require. Belt loaders are vehicles with conveyor belts for unloading and loading of baggage and cargo on aircraft. A front of the belt loader is positioned at the cargo door used for narrow-body aircraft and the bulk hold door on wide-body aircraft. Baggage stored without containers is known as bulk loading. Belt loaders can come in several different types, gas, electric, diesel, propane, and as a walk behind. Cargo containers are used to load luggage, freight, and mail on wide-body aircraft and specific narrow-body aircraft. It allows a large quantity of cargo to be bundled into a single unit. Container loaders, also known as cargo loaders or "K loaders", are used for the loading and unloading of containers and pallets into and out of aircraft. These loaders have two platforms which raise and descend independently. Aircraft catering trucks or cabin service trucks are used to transfer goods and equipment into aircraft with ease at varying heights. Prices starting at $25,000. Aircraft deicers are used when removing compacted snow and ice with a shovel or blade just isn't possible. That's where deicing equipment comes in handy. They generally dispense a heated, pressurized deicing mixture upon an aircraft to help remove built-up ice and snow. Aircraft ground power units or GPUs provide DC and/or AC power to the aircraft while on the ground. These units are used to help start engines, perform maintenance, or provide general onboard power while the aircraft is serviced in the hangar or on the ramp. We have both 28-volt GPU's as well as 120-volt GPU's in stock, some with combined air start units. Aircraft heaters are an efficient and portable solution for providing a clean and reliable blast of heat for aircraft, hangars, and ground support equipment. Towbars are used to connect the tug to the nose landing gear of the aircraft. The towbar must be long enough to place the tug far enough away to avoid hitting the aircraft and to provide sufficient leverage to facilitate turns. Heavier towbars, for large aircraft, are equipped with wheels. When not connected to an aircraft. The wheels are attached to a hydraulic jacking mechanism which can lift the towbar to the correct height to mate to both the airplane and the tug, and once this is accomplished the same mechanism is used in reverse to raise the towbar wheels from the ground during the pushback process. The towbar can be connected at the front or the rear of the tractor, depending on whether the aircraft will be pushed or pulled. The towbar has a shear pin which prevents the aircraft from being mishandled by the tug; when overstressed the shear pin will snap, disconnecting the bar from the nose gear to prevent damage to the aircraft and tug. Baggage carts come in four different varieties; enclosed, knockdown, open, and as a flatbed. Depending on your unique situation one may work better than another. Prices starting at $2,000. Baggage tractors come in a wide variety of sizes and models, typically ranging from 3,000 to 8,000 LBS drawbar pull (DBP). They are used to move bag carts, ground power units, lav, and water servicing carts. 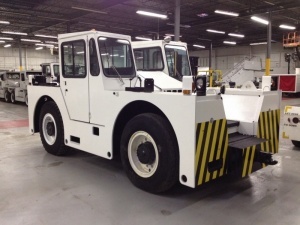 The larger capacity baggage tugs are also used as pushback tractors for commuter aircraft up to 90,000Lb in weight. Lavatory Service Trucks are a self-contained lavatory service solution. Units come with various tank sizes for waste and rinse. Used warehouse/ industrial tugs are available in propane and electric, suited for industrial material handling in a warehouse/ industrial environment. Open cab and closed cab options available. Used material carts for transportation of a wide variety of items. Structurally strong and easily modifiable by the end user.